While PETA's shelter still primarily focuses on providing humane services to sick, injured, and unadoptable animals, their facility continues to dedicate several enriched, home-like rooms to housing the relatively few adoptable animals PETA receives, while they await adoption, foster, or transfer to a traditional animal shelter. 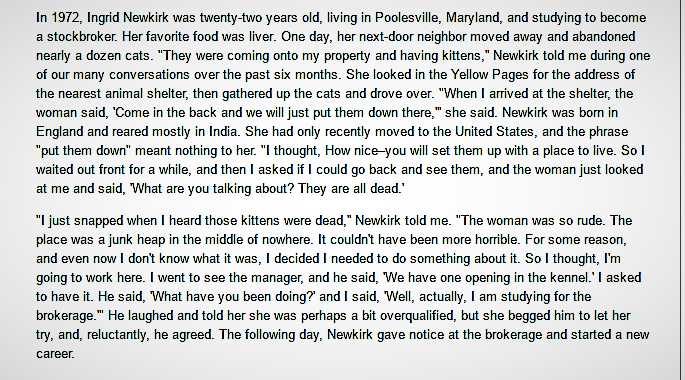 In the mid 1970's when Ingrid Newkirk held the position of Poundmaster, and the nation's Capital's first low-cost spay and neuter clinic was created, companion animal euthanasia was at an all-time high. Nearly a quarter of the entire companion animal population was being euthanized annually. Shelter specialists like Ingrid Newkirk set shelter euthanasia on a path to steady and meaningful decline, by making affordable spay and neuter accessible. Today, less than 2% of the entire companion animal population is euthanized annually, but there's still progress to be made. 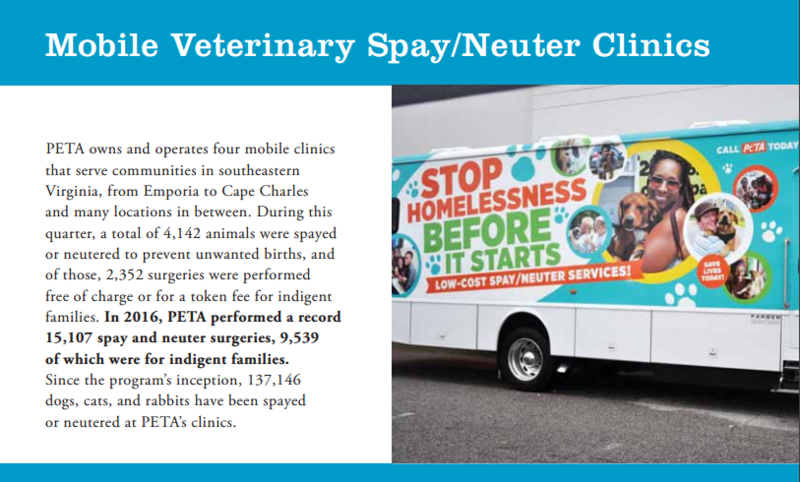 PETA's mobile spay and neuter fleet is in the community six days a week providing free and low-cost surgeries to communities that don't have access to traditional veterinary services, or simply can't afford them. 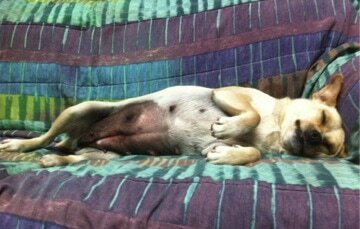 To learn more about how PETA saves community animals, click here. PETA's Virginia Department of Agriculture and Consumer Services animal reporting data and shelter inspection reports confirm that most of the animals PETA receives for euthanasia are received from their guardians because they either require humane euthanasia due to a current crisis of illness or injury, or are feral cats who are unwelcome and unserved by other shelters in their communities. 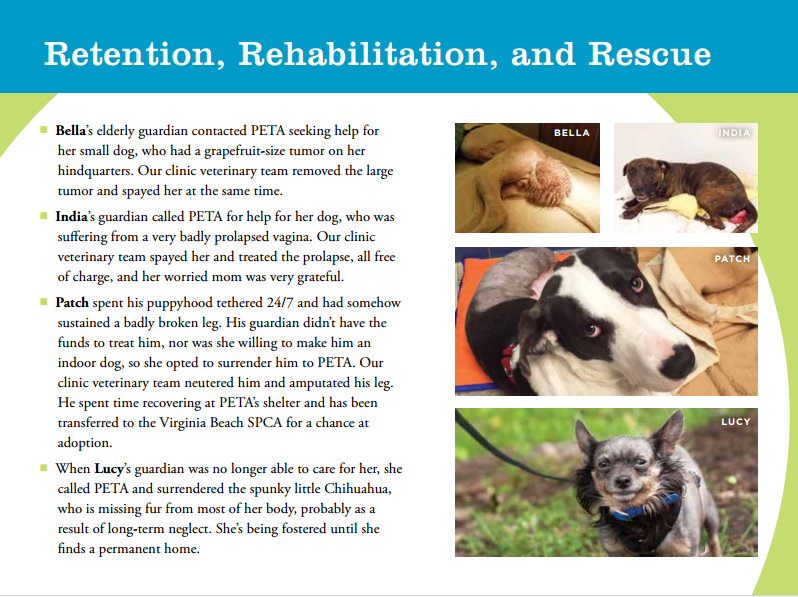 There is absolutely no indication these guardians aren't acting in their animals' best interests by requesting this service from PETA's shelter, or that it's in any of their best interests not to be immediately euthanized. 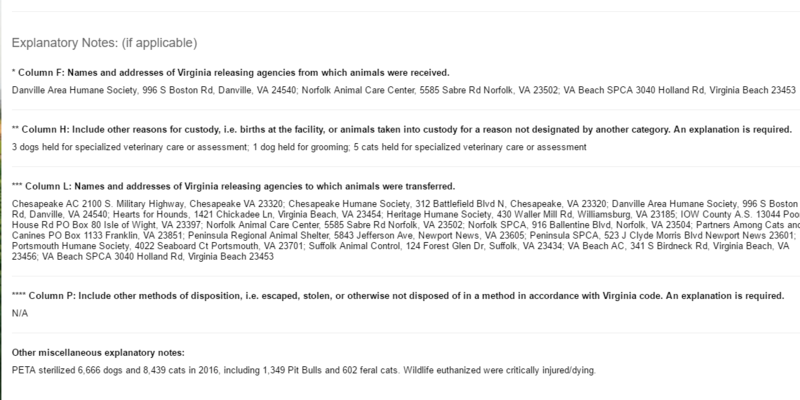 And because the state of Virginia only collects data on the animals that PETA takes custody of for the purposes of either adoption, transfer, and humane euthanasia, the overwhelming majority of animal served by PETA don't appear on their VDACS animal reporting summary records and are therefor unfairly absent in conversations about the work PETA does. Animals find themselves at the receiving end of PETA's euthanasia services because of one of two circumstances has occurred; PETA's Community Animal Project (CAP) staff has come across a profoundly suffering community animal while performing community outreach duties, or someone within the community has contacted PETA's Norfolk headquarters to request assistance with an profoundly injured, ill, or unadoptable animal. Only a fraction of the animals PETA's CAP program serves ever enter PETA's facility. The majority are served in their communities, in ways that are meaningful to them. PETA's CAP program isn't just about providing no-cost humane euthanasia to animals who require it. CAP program staff and volunteers provide other types of services to animals struggling in impoverished communities. They make food deliveries, transport animals to veterinarian offices for treatment and pay for their medical care, build and install all-weather animal housing, work with owners to get animals off of chains, and operate free and low-cost spay and neuter clinics throughout their service area. Virginia animal shelters are required by law to submit requested shelter data to the Virginia Department of Agriculture and Community Services' State Veterinarian annually. The VDACS publishes a summary of each facility's intake and disposition numbers on its website. Additionally, PETA publishes more detailed information on their website, in a quarterly format, in advance of the VDACS' annual summary reports. Below is a new animal reporting summary section the VDACS added for the 2016 reporting year, where additional information can be published. VDACS animal reporting summaries for previous years can be viewed here. In Virginia, there are four legal methods of shelter animal disposition; returning animals to their guardians; placing animals in permanent adoptive homes; transferring animals to other qualified releasing agencies; and euthanizing them. Virginia shelters are prohibited from reabandoning homeless and feral animals back onto the streets once they've taken custody of them. Because the state considers feral cats to be unadoptable, and it's unethical to keep feral cats caged into perpetuity, shelters that take custody of feral cats must euthanize them. 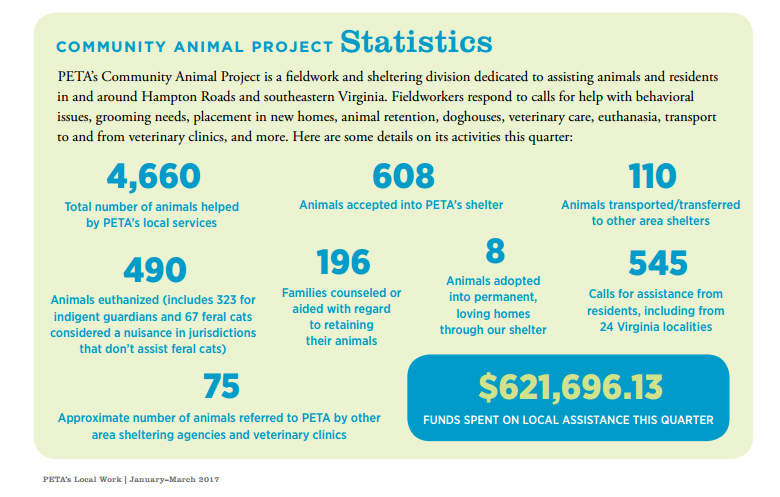 Like many Virginia animal shelters, PETA engages in TNR to the extent it's legal for shelters to do so, and always has. PETA provides free and low-cost spay and neuter surgeries and vaccines to managed feral cats in their community. PETA spays and neuters hundreds, sometimes thousands, of feral cats in any given year. In 2016, PETA spayed and neutered 602 managed feral cats for their caretakers. 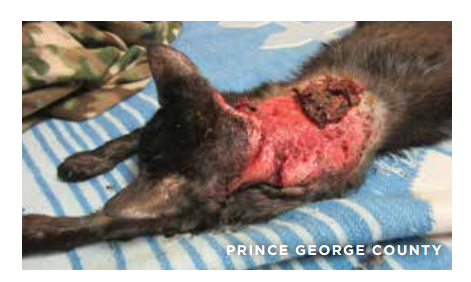 In early 2017, two probably well-meaning people in Prince George County contacted their shelter for assistance when they found themselves overwhelmed with over 200 feral and unsocialized cats, nearly all of whom were profoundly ill or injured. ​Their Prince George community shelter was too full to take custody of the cats, and the couple couldn't afford the $25 per animal surrender fee, which would translate to over $5000.00 in fees, even if the shelter had been able to take them. The couple called PETA to take custody of the cats, and over the span of several days, PETA staff trapped and euthanized the sick and injured cats. I know what you're thinking: there must be another way. There must be some scenario where these cats could've been medically treated, made healthy enough for spay and neuter, and then released in a community where they would be wanted and well-cared for. 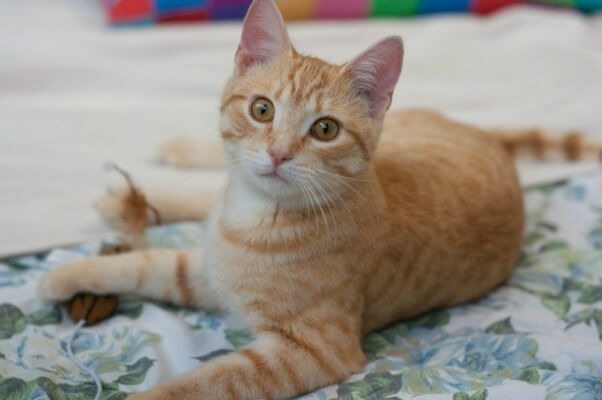 And if there were fewer cats, and they were otherwise being cared for but needed affordable spay and neuter, and vaccines, like many Virginia animal shelters, including PETA's, their community shelter would've gladly assisted them with that. But clearly this was a hoarding situation. This couple collected exponentially more cats than their time, energy, and financial resources could support. And based on the severity of the injuries and illnesses these cats were experiencing, allowing this couple to maintain ownership of them wasn't a viable option. 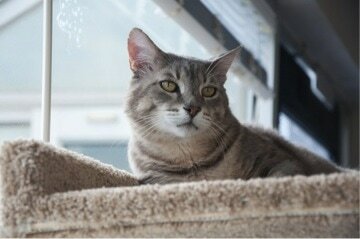 Any responding animal shelter would have had to take custody of the cats in order to attend to their suffering. And because Virginia shelters are prohibited from releasing animals back into the community, and people aren't lining up to adopt cats who they may never be able to house train or even socialize, any shelter would've been faced with these two choices; take custody of the suffering cats and euthanize them, or leave the problem for someone else to deal with.